Fog socked in the bay, the first hint that the end of summer might be near. Jogging along the path that hems the bluffs, I repeated thankful prayers that the heat might finally be ending. All the talk of pumpkins and colored leaves would no longer make me angry once the heavy blanket of summer temperatures lifted. As I approached the familiar faded sign threatening a $500 fine for anyone who abandons a domestic animal, a moving shape in the brush caught my eye. Slowing down to a walk, I recognized the leonine gait and tiger stripes of a cat. Ordinarily, I’d have resumed my earlier pace and not given the cat another thought. This one, however, looked just like our cat Simon, who had been hit by a car three years ago. Any time I see a Simon-cat, I pause and compare; probably out of habit, but possibly because if any animals are capable of reincarnation, it’s cats. Simon-cat stopped and stared at me, and that’s when I noticed the movement behind him. Some kind of metal bench had been erected in the hillside thicket of dry bushes, and atop it a gang of cats hovered. I ended up counting nine, all various types of tabby and tiger-striped, save for one token gray kitty. They all stared at me with typical feline blandness. A further scan of the hill yielded another seven cats, as well as a make-shift lean-to fashioned out of blue tarp, bamboo and palm fronds, all hidden within the brush. Nearby, I saw evidence that someone had taken it upon themselves to feed and water the cat colony; a series of bowls lined up next to the cat shanty. Some of the cats groomed themselves in their strangely yogic way, all spread limbs and sinuous positions. Others sat meditatively in tucked up balls of fur. Was this the reason for the sign posted up the hill? Did people really just dump their animals at the beach, hoping for the best? Sadness filled my veins in that peculiarly watery way only stray animals can provoke. It’s the sort of sadness that urges me toward the impulse to adopt them all, which is why I avoid adoption day at our local pet store. Coming home with a carful of cats would not be good for my marriage. So I did what I always do when my heart breaks for homeless animals; I steeled myself up and kept going, hoping to forget it in a few hours…or days. After jogging another thirty or so yards though, I noticed a form under a sleeping bag on one of the benches dotting the path. This was definitely not a mere park patron enjoying the cool offshore breeze and view of the harbor. This someone was sleeping. Nearby, the telltale backpack decorated with grime told the rest of the story. I kept jogging. Unfortunately, a person on a bench is a much more common sight than public housing for felines. Still, the sadness coursing through my system felt different this time. **Sorry, this line came to my head when I thought of you coming home with a carful of cats. Abandoned animals are tough. My daughter cries every time the ASPCA commercial with Sarah McLachlan singing comes on. “I can’t take this, daddy, turn the channel,” she says. Chris Plumb recently posted…Looking for Love in All The Agnostic Places. I laughed so hard at that – THANK YOU for pointing out that parallel. If given a chance, I’d take them all…then regret it immediately. 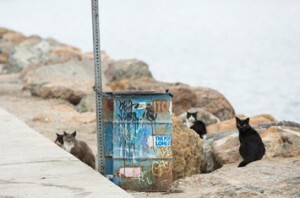 Who knows – maybe the homeless person was the one who built the cat shanty & was doing what could be done to feed them – who to better understand their plight? Can’t someone help? Isn’t there someone to call? What happens to those poor cats when the food stops coming cos someone got bored or moved? And what will happen when the rains come? So sad. Enchanted Seashells, Confessions of a Tugboat Captain’s Wife recently posted…When Is A Friend Not A Friend? I actually don’t know if it’s a planned feral cat colony, a bunch of strays, or abandoned animals. The local ASPCA is definitely aware of it – I’m not sure of the protocol. I’ve taken in plenty of stray animals in my life…but unfortunately, we can’t take them all in. Or all the people that need our help, either. I know, and I tell myself that. It still is so painful. See, now this bugs me. We have (here in England) a Royal society for the prevention of cruelty to animals, yet the one for children is only national. In shopping centres where you get given a token with your groceries to put into a box supporting a selection of local charities, the ones for animals are always fuller than the ones for people. It baffles me how we can look past our fellow man in need to help an animal. I know, I don’t know what that’s about. Perhaps because domesticated animals are so much at the mercy of human treatment…or people are just cruel? I don’t know. 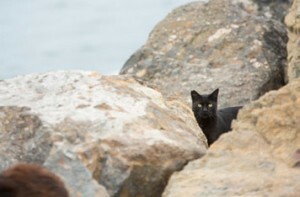 I wouldn’t assume that people just dump their cats on the beach. We’ve had many, many, many, many, too damn many cats since we moved to our current home in SoCal. It’s just impossible to keep them confined to the house. They go through the screens and get out. We’ve finally surrendered, no more cats. No, I’m sure they aren’t all abandoned – many are probably feral. But that was my initial reaction after seeing that sign. Seriously, who dumps their animal in the city, expecting it to end up like Born Free? I have always been a sucker for stray cats. All of the cats we have, or have ever had, were abandoned. They’re so fascinating, and way more resilient than us humans. I know. It always makes me so frustrated I can’t do more to help. Thank you. wow.. all those cats. why does it make me feel a little better than they’re in a kind of community themselves..? so wonderfully descriptive, almost spooky with them popping up like that. It was kind of spooky. I jog by there often, and seeing it hidden there made it feel like an underground colony. At least they aren’t alone. I always want to adopt them all too. A couple of years ago a family of seven kittens and a mama came over to visit and we adopted the littlest of the bunch who sadly died two days later. I wanted to take them all and find them homes. The post office up the street takes them in and they have a small pack of them behind the counter. Mascots. When I first moved to DC from Denver, I volunteered at a pet adoption day to meet people. Took home a dog. Already had a dog. Ended up calling an ex to fly out and get the new dog because two was too many. Sigh. Stray or homeless animals are heartbreaking! I know. Sigh. Sounds exactly like something I’d do. I don’t even like cats and I found this touching. I’m lucky, in a way, that my husband is allergic to cats. I grew up with a cat and I’d want to rescue them all too (but my neighbor has 6 and that’s quite a few too many, I’ve seen). Yes – at one time, we had four (mommy + litter), and WOW. WAY TOO MANY. How sad! I rescued my two kittens from a box on the side of the road marked “kitens.” I was heartbroken and so sad to think that people are capable of such negligence. I know. I am a sucker for abandoned kittens in a box.